Revell/ Monogram seem intent on making life difficult for more than one slot car enthusiast. Just at a time when there are more than enough models to chose from, they release cars like this! Well, just one more then, ‘til the next time! I know this review has been covered on other boards ‘til the cows came home' but maybe amongst the following you might find the odd snippet as yet unmentioned. When I opened my much awaited March 83G some weeks ago now, it struck me, virtually. The bold contrast of the Blue Thunder livery is, to say the least, striking! The car finish goes from white to black in four easy steps passing through two very luxurious shades of metallic blue along the way. 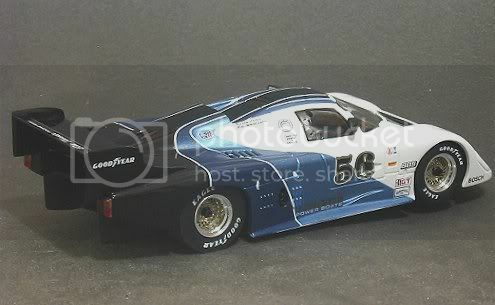 This is a reproduction of the car driven by Randy Lanier and Bill Whittington in the 1984 IMSA Championship (USA). March Engineering were a small English company who developed a penchant for car racing of many kinds. They built and sold bodies/rolling chassis for a lot of motor sport groups, some of the more notorious being the GP car with the ‘Surf Board’ front wing and the equally striking 2-4-0 GP car with a four wheel drive rear end. The lines of this car demonstrate aerodynamics at their peak in the early eighties, after all, to this day it’s still hard for manufacturers to keep all the knobbly and lumpy bits of a car out of the air stream without dramatically raising their coefficient of drag. After chasing down some contemporary pictures on the Internet I can only admire the achievements in this model. 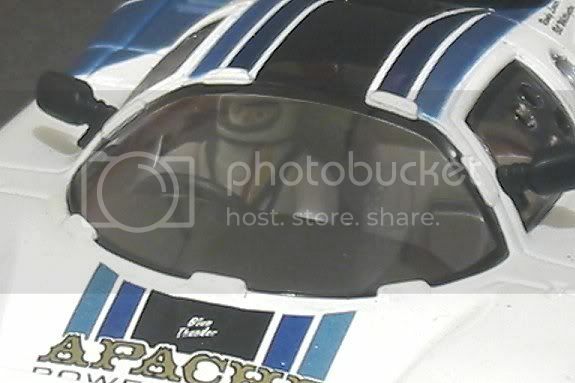 The Tampo is meticulous, original decals reproduced faithfully even down to almost unreadable print ‘Carrera Design Bodyworks Inc’ below the fuel fillers. All tampo is well placed and aligned. The definition between body colours is almost faultless. Transmission detail well into the rear of the body and sharp rear light units finish off a very neat rear end. Again the Wheels have immaculate alloy spoke details, not too bulky, and brake disc are clearly visible behind. A well scaled driver sits behind detailed vented side screens and shares the cockpit with a high degree of detailed dash and floor pan, even though they are very difficult to see! 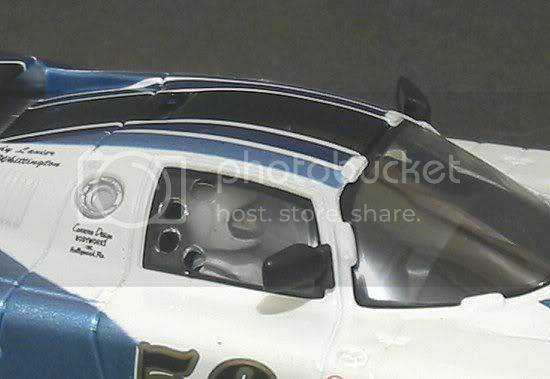 Again as with other Revell models the rear view mirrors are realistically silvered. Finally, at the front, hardly visible detail has been included. The cooler radiator sits in the rear facing vent in the bonnet and the very front has what looks to be a copy of a front air dam complete with towing eye. Now comes the hard bit, this car was bought to run, yes, regardless, it has to serve its purpose. So casting aside all thoughts of impending breakages I took it along to my local 4 lane classic Scalextric track. Out of the box, gently, on the track. Slowly picking up the controller, squeezing the trigger, more, a bit more then off it moves. Quiet, very! Impressive, very. Slowly picking up speed, caution in the corners. Fast, faster, faster! No need to worry at this point. The 20-odd metre track is probably the smallest you would race this on. 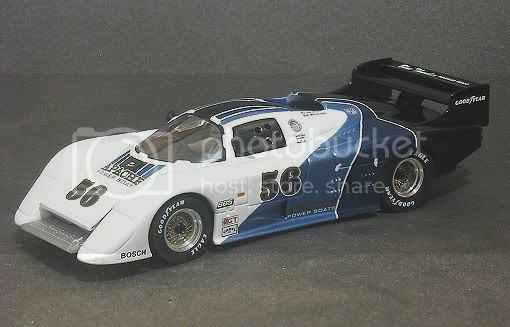 Revell decided to gear this beauty for the fast lane, 37z spur and 14z pinion! 2.64:1 in my books. Along with a rear wheel diameter of 22.5 mm it has long legs, VERY long legs! The 45 ohm controller was probably not up to full speed control. I feel a 25 would have been better but all the same the car was easy to control once you got used to driving it on half a resistor. Pushing it harder, it was obvious that this car was built in the Carrera mode, A slow pick up to a quick end speed, early braking at the end of the main straight because of the reduction in engine braking caused by the low gear ratio. In spite of this , I soon settled in to do 5.8’s on the track and the corner entry speed was impressive as well as the exit speed. But unlike some ‘glued down’ cars, high speed cornering leads to a final exit slew of the tail just catchable if you’re on your toes. This model has a two position magnet. It looks deceptive as it is not all shiny like the neodymium mags of other manufacturers but rest assured, it has plenty of ‘gauss’! 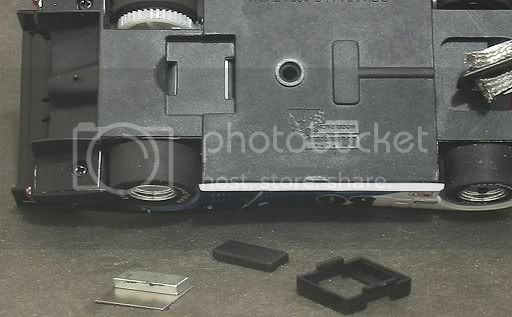 The magnet is mounted below the motor and is situated in a little clip on tray. The magnet sticks itself to a small piece of what looks to be stainless steel. To adjust it you simply reverse it in the body recess. It takes the magnet about 10 mm closer to the rear axle and this can be done from under the car. It takes about 3.74 seconds!! Finally getting into a rhythm the car and I settled into the comfort zone and I would expect to get another three to four tenths out of it in competition. From out of the box there were no bad habits. The guide sits as deep as it goes and the solid front axle doesn’t create much differential drag. I would certainly fit a Wixle though if it were ever to be comp raced. Tyres and wheels are very good, concentricity being 95% and tyre compound appears to be the same micro foam rubber as fitted to some earlier scalex F1’s and MRRC cars. Plenty of grip. The opportunity arose to pit it against the Slot it 956 Porsche and so after running a few more laps I went side by side with a fellow racer and the Porsche. The Slot it Porsche was quicker out of the corner onto the main straight and pulled a couple of straights out by ¾ distance but the March can hit the corners harder, pulling back a straight and a half and consuming the last half straight gap on the infield section. Both these cars were out of the box, no mods, and after several minutes running the swings and roundabouts effect found them lapping on a par, albeit on the ragged edge. Lower profile tyres would enhance its cornering and contribute to its off the line speed. Placing my Baby on the track I pushed off fairly quickly and was soon into the rhythm. Again the car lacked kick in the back acceleration but was still no slouch, corner entry speed (no magnets) was still very high and cornering and exit speeds very respectable. Tyre compound is suited to painted surfaces. The model has an 84mm wheelbase and a 48 mm track. It sits very low on the track compared to a lot of its contemporaries having 2.5mm clearance at the sills and 2.0 mm at the front. I ran it for several minutes and it showed no signs of ‘hot motor’ fatigue although the motor was running very warm. The tyres kept their grip and the car behaved very respectably for the duration. End of testing and nothing to adjust, replace or remove. Removal of the body is by four screws, one in each corner. I don’t usually like this as it reduces the scope of running the body loose enough to aid cornering as some of us do. 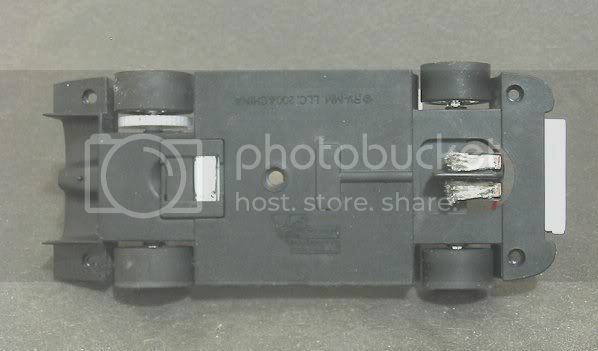 The interior detail is fixed to the body shell so there are no messy bits and pieces falling out when trying to conduct simple maintenance tasks, Who remembers the Scalex Cadillac LMP! On looking inside to find out what makes this car tick, there is an ‘S’ can Mabuchi complete with network of capacitors and inductors, clipped firmly onto the chassis. It feels probably about 21.000 rpm. Mounted sidewinder fashion against the rear axle, it drives a nylon pinion and spur gear which is a press fit to the axle. There are nylon bushes front and rear as axle mounts. The spur side bush had some noticeable up and down play which hadn’t affected it during test but which should be seen to. 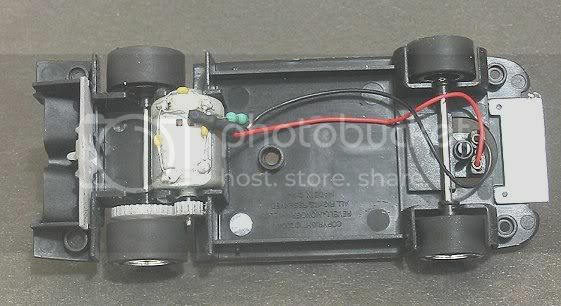 The front axle is solid and the guide is a typical ‘90’s style Scalextric/SCX guide with tinned braids. The guide has provision for up and down movement but as this car runs on all four wheels, it sits neatly in the fully up position with standard front tyres. The chassis differs in style from some of their other models in that it is a plain flat chassis as opposed to the ‘busy’ 3D chassis of the P550 and Corvettes. Everything fits snugly in place and there is a crisp closing action when the body is refitted to the chassis, no jiggling wire into 0.03 of a millimetre gaps to allow bodies to fit. I found this model to be a great pleasure to drive both leisurely and hard and fast. There is plenty of scope for the racer to modify it, probably rear tyres and gear ratio for the serious racer. Motor for the maniac! But out of the box on board it showed no sign of tramp and no signs of random deslotting on the straight, both of which occur in some of the more expensive models. No ballast was contemplated at any time. On plastic, it was well behaved and probably a little docile compared to the competition but a change of gears should alter this. So, do I race it. Yes? No? Probably no. In the class it would compete in there are several more able models. It would need re-gearing to race on anything less than an eight laner. And if it were to be raced on an eight laner it would need a motor upgrade. But I’m still in love with it. I can run it at my own leisure and amongst friends and admire its striking appearance and its quiet operation. Then I can re box it and further admire it as I pass it in pride of place in the study. This is a beautiful model, in my opinion, nearly all else pales in its presence. So If you want a superb model which doesn’t have a Porsche or Ferrari badge then this is it. If you want a model which is well behaved and a pleasure to drive and unwind after a night of hectic racing. Then this is it. If you want purely to admire it across the lounge or study, then this is it but if you want a race winner out of the box then you may have made the wrong choice.